Iron in a form for enhanced absorption without gastrointestinal side effects. 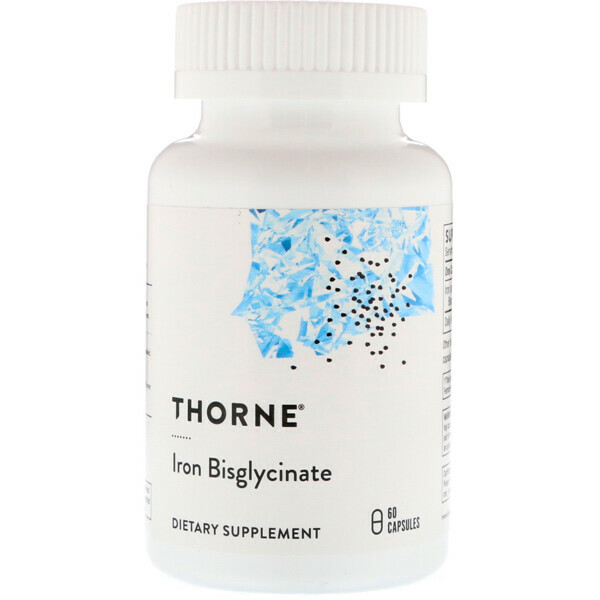 Iron Bisglycinate provides an optimal way to supplement iron, which is essential for red blood cell formation. 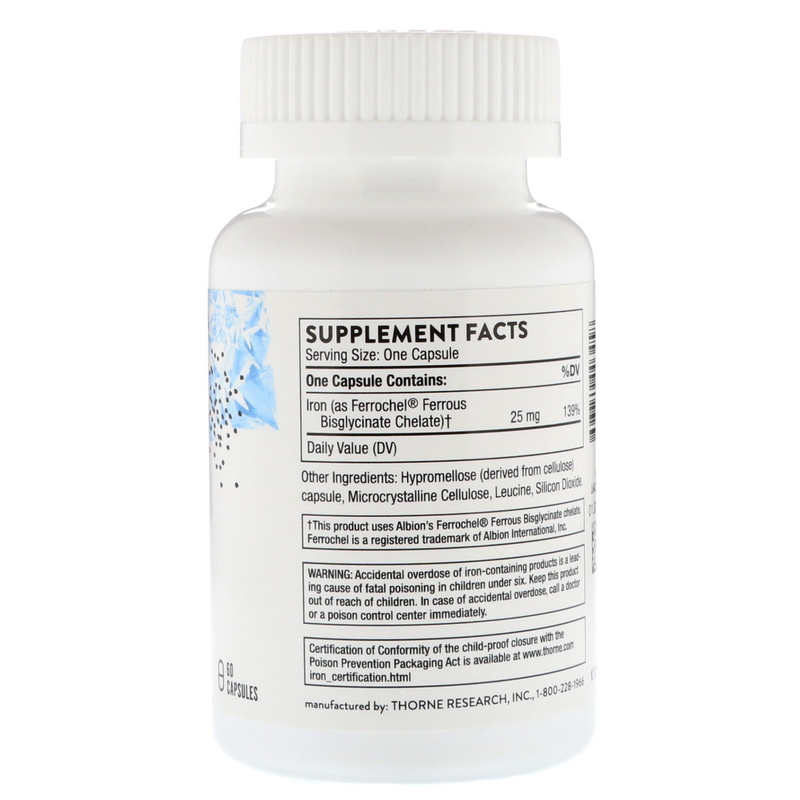 It helps fight fatigue and other symptoms of iron deficiency in athletes and others. NSF Certified for Sport. Thorne's Iron Bisgylcinate is NSF Certified for Sport. It is essential for the formation of red blood cells. The U.S. Centers for Disease Control has determined that the prevalence of iron deficiency is greatest among toddlers (7% of those ages 1-2 years) and menstruating adolescent and adult females (9-16 % of individuals ages 12-49, whether they are athletes or not. Conventional iron supplementation, including forms such as ferrous sulfate, can cause gastrointestinal side effects – including nausea, vomiting, constipation, diarrhea, and dark-colored stools – because these conventional forms of iron are poorly absorbed. Thorne's Iron Bisglycinate provides 25 mg of elemental iron per capsule that has been reacted with glycine for optimal absorption in the gastrointestinal tract, thus helping to decrease the typical gastrointestinal side effects. An iron deficiency can manifest as weakness, fatigue, shortness of breath on exertion, dizziness, tinnitus, spots before the eyes, drowsiness, irritability, infrequent menstruation, and loss of libido. Athletes need approximately 1.5 times as much Iron as non-athletes. Those who follow a vegetarian or lower protein diets may have needs as high as 1.8 times as much dietary iron. Blood loss from injury and muscle damage, as well as GI bleeding associated with extreme endurance activities can further decrease the body's iron stores. Tamper Evident: Use only if bottle sealed. Store tightly sealed in a cool, dry place. Accidental over of iron-containing products is a leading cause of fatal poisoning in children under six. Keep this product out of reach of children. In case of accidental overdose, call doctor or a poison control center immediately. This product uses Albion's Ferrochel Ferrous Bisglycinate chelate.